How can we change the global tint color on iOS7/iOS8 by code? I want to change multiple objects that use this property, but not change each one, that's why I want to use the global tint property. Simply change the UIWindow 's tintColor in your application delegate, it's automatically passed as default to all its UIView descendants. There are two ways to change your global tint color. As many mentioned above you could change self.window.tintColor in -application:didFinishLaunchingWithOptions:. 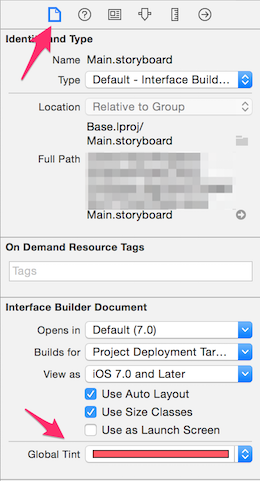 More elegant way, in my opinion, is to set Global Tint in File Inspector in your Storyboard while nothing is selected. This way your -application:didFinishLaunchingWithOptions: is cleaner. Not the answer you're looking for? Browse other questions tagged ios7 uicolor tintcolor or ask your own question. How can I change the global tint color programmatically? How to change button text color of UIAlertView in iOS7?